Women who take vitamin D after being diagnosed with breast cancer may have an increased chance of survival, new research supported by the Irish Cancer Society has shown. Researchers from the Irish Cancer Society cancer research centre BREAST-PREDICT analysed data from almost 5,500 breast cancer patients and found that taking vitamin D supplements after diagnosis was associated with an increased relative survival of 20 per cent compared to those who did not. The study was led by cancer researchers based at RCSI (Royal College of Surgeons in Ireland). 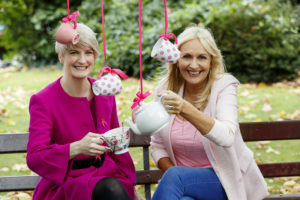 The findings were revealed as breast cancer researchers, survivors, and broadcaster Miriam O’Callaghan launched ‘Cups Against Breast Cancer,’ an Irish Cancer Society fundraising campaign which aims to raise money for breast cancer research and support services. Breast cancer is the second most common cancer affecting women and in Laois 38 women were diagnosed with breast cancer over a 12 month period. Head of Research at the Irish Cancer Society, Dr Robert O’Connor, said: “This research is an example of the vital BREAST-PREDICT, made possible by the country’s support of fundraising campaigns like ‘Cups Against Breast Cancer’. “Since the Irish Cancer Society established BREAST-PREDICT five years ago, we’ve funded the work of over 50 breast cancer researchers across the country. That’s meant a €7.5 million investment that’s only been possible through the public’s generous donations. This research was led by RCSI researcher Dr Jamie Madden, under the supervision of Prof Kathleen Bennett, Associate Professor in Pharmacoepidemiology at RCSI Dublin. For the research, anonymised data on the pharmacy claims of almost 5,500 women with breast cancer aged 50-80 between 2000 and 2011 was provided by the National Cancer Registry of Ireland. The research team’s findings were recently published in the journal ‘Breast Cancer Research and Treatment’. While the findings are significant, the researchers did not have access to information on other measures from the women that could possibly impact their likelihood of better outcome. For example, increasingly studies are showing that moderate physical activity and maintaining a healthy diet can benefit a patient undergoing cancer treatment but this was not collected in this study. The research also found vitamin D users to be younger on average, be less likely to smoke and have lower tumour stage and tumour grade progression compared to non-users, all factors more likely to be associated with better survival. Dr O’Connor added: “Before rushing out to buy vitamin D supplements, we urge women with breast cancer to first talk to their medical team. Vitamin D use can cause health issues and each woman’s cancer is unique and will require personalised treatment.